Hi there! Are you ready to plan an exhilarating trip to Mount Rainier National Park?! You’ll feel like you’re on top of the world as you explore this 14,410-foot volcanic peak and the scenery that surrounds it! You are sure to find something here that everyone in your group will LOVE. Mount Rainier is a place you will never forget — and likely somewhere you will talk about for years to come. Dramatic mountain peaks, humongous glaciers, and sparkling lakes and waterfalls can be found everywhere you turn. This incredible place will leave you speechless! I’m a former park ranger, and I’ll help you plan your vacation down to the details. I’ve extensively explored Mount Rainier and am here to help! 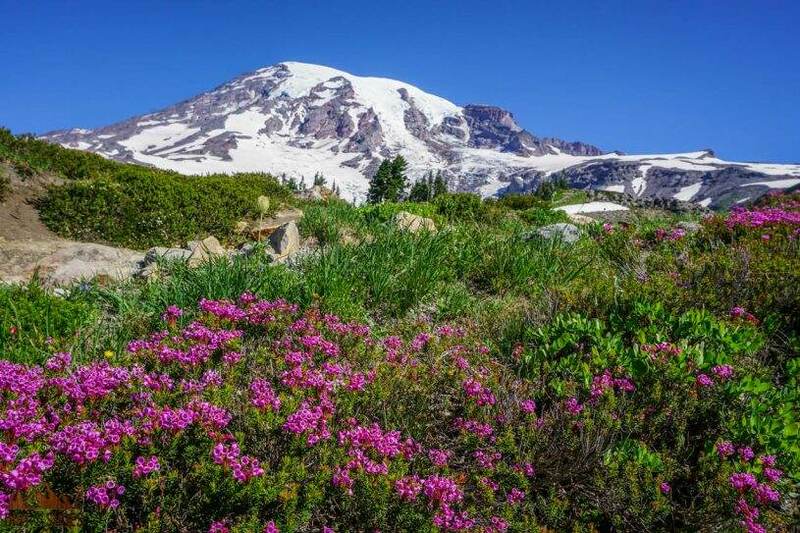 Whether this is your first time to Mount Rainier, or if you are returning after many years and would like to be reintroduced to the park, this list of 10 things is for you. Mount Rainier is open year-round. Summer is peak season in the park, with prime wildflower viewing in late July and August. Trails are often snow-covered until mid-July or so. For more information on the park’s operating hours and seasons, click here. Lodging within Mount Rainier is available at Paradise and Longmire. Restaurants are located in both those locations, as well as up at Sunrise. The outside communities of Ashford, Packwood, and Enumclaw also offer numerous lodging and dining options. There are 4 NPS campgrounds in the park, with the majority of the campsites being reservable. You can learn more about camping in the park here. The weather is crazy up here! It’s not uncommon for the mountain to be covered in clouds during some or all of your visit, especially during the spring and early summer. The temperatures and conditions can change in an instant, so be prepared with the right gear and knowledge for the trails you plan to hike. Numerous hiking trails converge and overlap in this park, so you don’t want to be caught hiking in the park without a map. 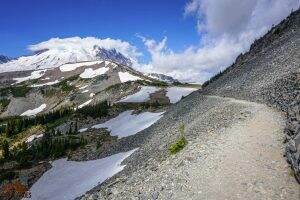 This is the map I use and recommend for Mount Rainier National Park. 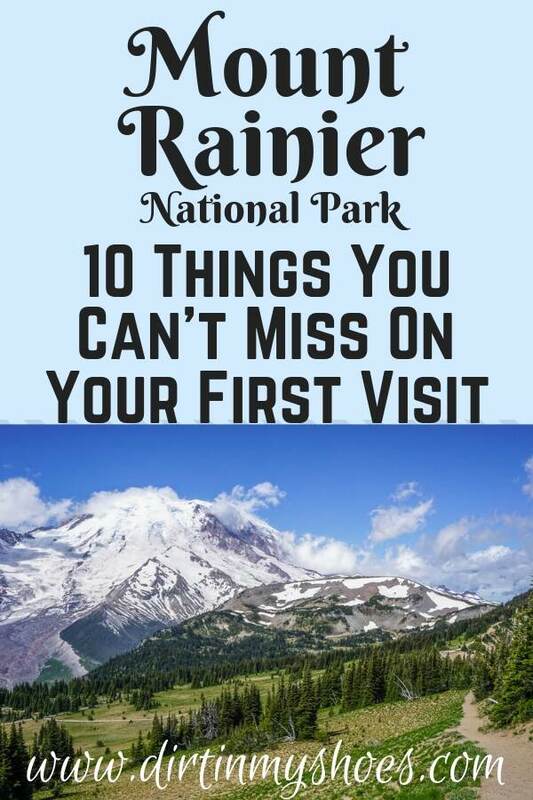 Click NEXT to see this exciting list of 10 things you can’t miss on your first visit to Mount Rainier National Park! Will you be making an itinerary to purchase? We use your itineraries yearly on our vacations and love them. We visited Zion last year and your itinerary was very helpful. We also met another family using your itinerary. Thanks for all your wonderful professional advice! Hey Brandy! I am going to start writing more itineraries starting January 1. Mount Rainier is high on my list and should be finished in the spring 🙂 Glad you like them! Now you’ve really got me wanting to get to Rainier! Your photos are beautiful. Thanks for this can’t miss.